and under His wings I find refuge. To the loud drowning sound I let myself float. Surrender to the chaotic beauty of rhythm and love. The piercing sound starts to take over. It’s time to birth a new scar. Ink one with my skin. Ache one with my body. The more it tightens its hold on me. The more I experience freedom through my bones. The more a tear wishes to escape. More ecstatic the heart gets. Let the body melt to temptation. Let the mind free itself from heartache. Time to give in to pleasure. This entry was posted on March 17, 2013 by mitchellez. It was filed under Uncategorized . What a beauty weaved even in pain. 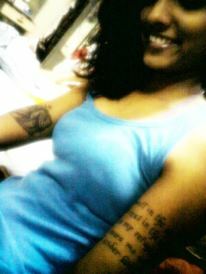 And I love what you got inked. Having three tattoos myself (all personally designed) I was really moved by the imagery in this piece, not just for the prospect of the ‘beautiful scar’ endpoint, but the whole journey that you go through in having something inked into your skin.